The Russian Federation’s newest subject is likely to be designated a special economic zone. A preferential tax regime, state investment and the development of existing sectors should eliminate Crimea’s dependency on subsidies and turn it into a net contributor. Russian Prime Minister Dmitry Medvedev has already announced plans to set up a special economic zone on the peninsula. The purpose is to turn Crimea from a region that relies on subsidies into a net contributor. Vadim Tretyakov, head of the open joint-stock company Special Economic Zones, is convinced that Crimea is a promising region, not least because of its geographic location. A special economic zone is an effective instrument that helps attract direct investment. In Crimea, the whole region could be assigned this status, as was the case with Kaliningrad. Tretyakov believes that the creation of an economic zone in Crimea will follow special rules and that the peninsula will become a mixed-type special economic zone, combining several development clusters. "The companies that will be implementing investment projects in Crimea could be exempted from certain taxes under the rules for the newly-created special economic zone," Medvedev said. One of the options being considered is the establishment of a gambling zone. According to the republic's prime minister Sergei Aksyonov, the Crimean government is already looking for a suitable location to build casinos. However, experts are skeptical about the prospects of this option. "Russia has so far not managed to successfully implement a similar project," points out a regional director with the rating agency Expert RA, Vladimir Gorchakov. The most promising areas from the point of view of developing the special economic zone and attracting investment could be those sectors that are already relatively well-established in the region: tourism, manufacturing and transport. "The region's biggest potential lies in tourism," says Vladimir Gorchakov. 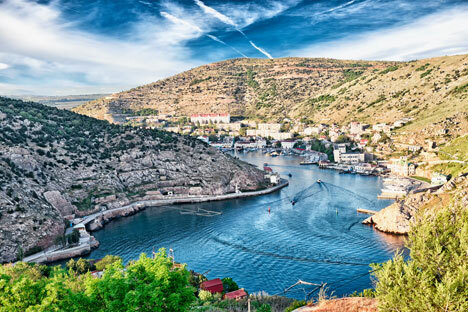 According to official statistics, Crimea is Russia's second biggest region in terms of tourist accommodation capacity. In other words, for a tourist to find a hotel, a room or a flat to rent there is not a problem. However, 80 percent of this business remains "in the shadow", i.e. unregistered and undeclared. Experts are convinced that introducing tax breaks for businesses operating in the sector would encourage owners to become fully legal and would attract Russian and foreign hotel operators to the region. To that end, Gorchakov believes, a so-called “imputed tax” could be implemented, i.e. a fixed tax on expected income. In addition, in order to boost tourist flow, the transport infrastructure requires development. Until now, most visitors to Crimea entered the peninsula from mainland Ukraine. Vladimir Kantorovich, president of the Russian Association of Tour Operators, estimates that on average, 4 million Ukrainians and 2 million Russians visited Crimea every year. Most of them traditionally came by train, with just 300,000 tourists arriving by air. The second most promising area for Crimea is the development of the region's industrial potential. "Manufacturing is the region's main sector today, generating 37 percent of budget revenues," says Gorchakov. The leading sectors are agro-industrial and chemical production. The segment most attractive for investors is agro-industrial production: grain, cattle breeding, wine, fruit and vegetables, as well as the cultivation of oil-bearing plants, such as lavender, rose, and sage. Experts expect that Russian agricultural holding companies from the country's regions with the best developed agriculture, the Krasnodar Territory and the Rostov Region, may be interested in investing in Crimea. Yet in order to develop the agricultural sector, one problem must first be addressed, that of water supply. The Russian authorities plan to tackle the issue of water supply by building a seawater desalination plant, as well as a pipeline from the Krasnodar Territory, where a water tank farm will be located on the Taman Peninsula. Finally, the third most promising area is the development of a transport and logistics hub. According to Gorchakov, at the moment, transport accounts for just 10 percent of the region's economy. This figure is made up largely by four commercial ports: Yevpatoriya, Yalta, Feodosiya, and Kerch. "In future, major Russian private and quasi-state investors could be attracted to contribute to the development of these ports. This can be further promoted by the establishment of a special port economic zone in the republic," says Gorchakov. Russian investment in the region will initially come from the state and will be focused on developing the region’s military-industrial complex: A large naval base is likely to be set up in Crimea. As for trade potential, the infrastructure of the Crimean ports is much older than that of major Russian ports on the Black Sea. Investment in upgrading facilities is likely to come from companies that would be attracted by the region's potential, for instance major logistics operators, with FESCO – Russia’s largest intermodal transport operator - at the top of the list. However, Gorchakov stresses that the issue of demand needs to be resolved first, since until now Crimean ports were used for the import and export of goods by Ukraine alone. Sergei Khestanov, managing director of ALOR Group, points out that as soon as the issue of transport has been addressed, the region will enter a new level of development. In his estimate, Crimea may become self-sufficient in three to five years' time. As regards investors, state companies will be followed by private ones and, in the longer term, once the issue of the status of Crimea at international level has been resolved, by foreign investors too.